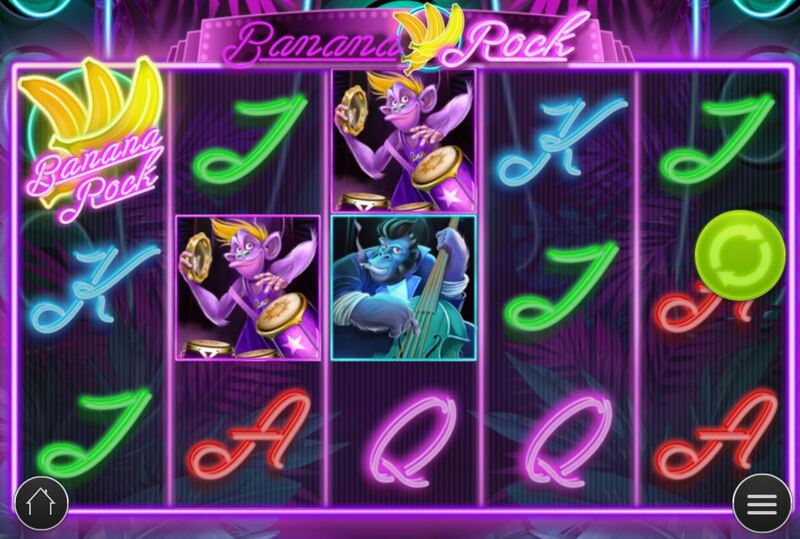 Banana Rock slot is absolutely crazy and for once you can forgive the childish theme and appearance as it's quite colourful and fun to play, in an oddball sort of way. The theme is a Rock Band consisting of 5 Monkeys, thrashing out some chords that wouldn't be out of place on Netent's Guns N' Roses or Motorhead slots although there won't be any platinum discs for this lot! The reels are transparent and set over some coloured palm fronds and powerful speakers with rolls of music as you spin and some thrashy chords when a win appears. 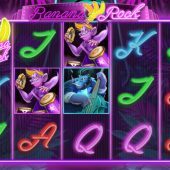 These monkeys may be churning out a few hits, but will our bankroll take one too? We have 10 paying lines on Banana Rock slot with symbols appearing both stacked and singly on the 5 reels and 3 rows. As you would expect, the five band members pay the high 5-of-a-kind wins with Yellow Guitarist paying 40x, Green Drummer 20x, Orange Keyboard Player 16x, Blue Bassist 12x and the Pink Bongo Player 8x. Four card values from Ace down to Jack all pay 4x and it is possible to get 5 Disc Wilds which also pay 40x along with the Yellow Guitarist, but you won't get them conventionally! Right, you can see a Gold Disc Wild on all reels but you want them to land as far apart as possible if you see two, because when this happens the rightmost one expands to fill the reel and the leftmost will expand along the row it lands on until it joins with the expanded one. Obviously this won't happen if they're on adjacent reels, but if you see them on 1 and 5 then you are guaranteed a full line of Wilds for 40x, plus a few other decent wins. A Banana Scatter on reels 1 and 5 is required for 10 free games which cannot be retriggered but each scatter appearing during them awards one extra spin. Your enhancement is achieved by landing any of the stacked band member Monkeys fully in view which will add 1x to his respective multiplier which is displayed above the reels. This can reach up to 5x but it does nothing in the games themselves unless a win is formed from that particular monkey. We need to wait for the Encore afterwards! Encore - once the free spins end all the multipliers collected are added together so you can have 1 up to 25x in play. You then have one spin with only the Band Member Monkeys on the reels and Play'n Go proudly proclaim that this can award up to 2500x bet. Yeah, and I'm a monkey's uncle.